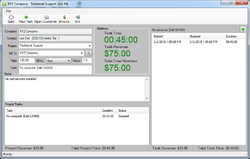 PowerTime Tracker is a time tracking and customer billing solution. Power Time Tracker 1.0 was available as a giveaway on May 3, 2016! Power Time Tracker is a time tracking and customer billing solution made for freelancers By a freelancer. 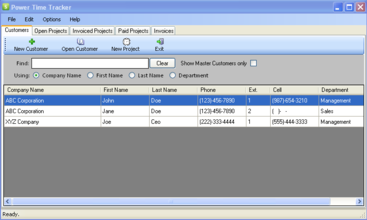 It provides a quick and easy way to enter customer and project details that can be billed using an hourly or flat rate. It makes it easy to track which projects are open, invoiced, and paid. 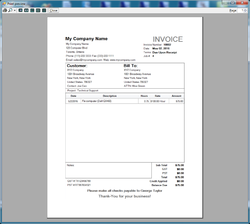 You can generate invoices for your customers with just a couple mouse clicks. A comprehensive video tutorial demonstrates how to get the most out of the product. Prompt and professional customer support is provided for any product issues. A life-time license is guaranteed for the best suggestion for Power Time Tracker with included tecnical support and a life-time license for MP3 Tag Express! How would you improve Power Time Tracker 1.0? 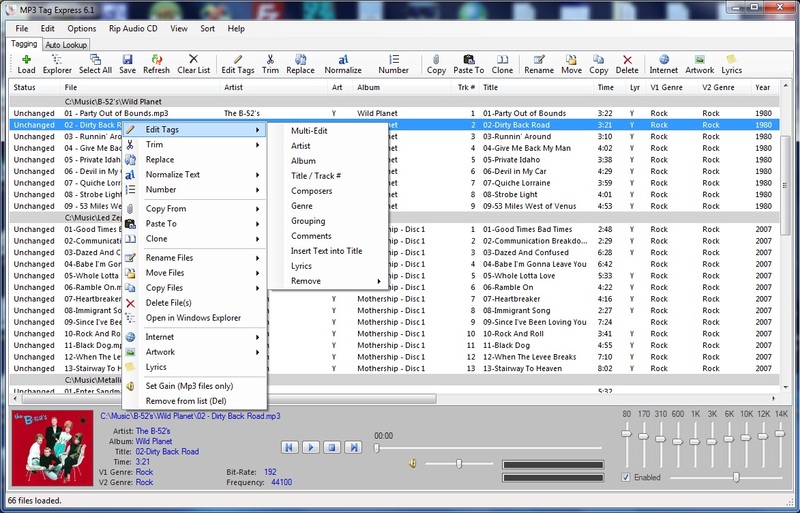 MP3 Tag Express is an audio tag editor that specializes in mass-modifying tags and bulk-renaming files. It includes a wealth of editing functions and a CD ripper. 25% discount for GOTD users only Today! For those who may have had difficulty registering due to the load on my domain, I will be extending my license activation for an additional 12 hours. Ladies and gentlemen, I am the developer of this product and I truly hope those who take an interest in my offering will benefit from it in terms of saving time and maximizing their profit. Thank-you very much. George Taylor, don't forget when providing us with or supplying future updates to increment the programs version information otherwise support will become increasingly difficult if the end user cannot tell you exactly what codebase they are using! 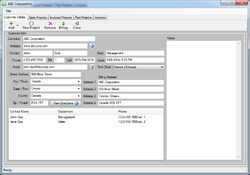 George Taylor, created a trial company, an initial customer and a new task comprising of a couple of work sessions... then went to print an invoice to a virtual PDF printer and the far right of the document with the Amount header truncated to "Amoun" and everything else to the right outside the printed page area. If after issuing that first invoice I do some more timed work on that project the task revenue increases but then on stopping and printing another invoice all I get is the original invoice with no changes, same duration and charge completely ignoring the extra work! I was expecting a second invoice with new invoice number and a bill for the new time only. I cannot share the PDF's generated as they have real world details on them. As expected for an Alpha release this is not ready for real use yet, sorry. 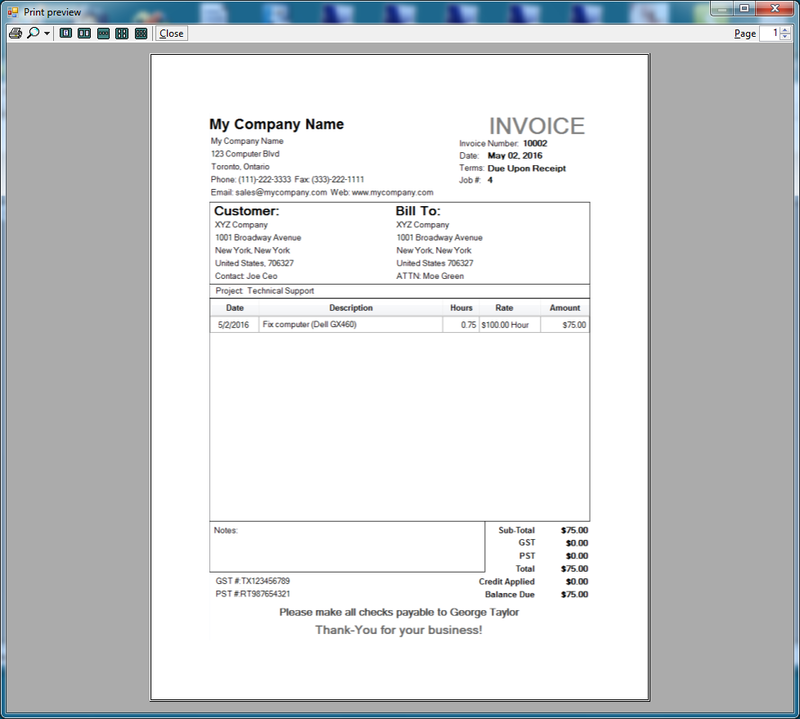 George Taylor, created a trial company, an initial customer and a new task comprising of a couple of work sessions... then went to print an invoice to a virtual PDF printer and the far right of the document with the Amount header truncated to "Amoun" and everything else to the right outside the printed page area. If after issuing that first invoice I do some more timed work on that project the task revenue increases but then on stopping and printing another invoice all I get is the original invoice with no changes, same duration and charge completely ignoring the extra work! I was expecting a second invoice with new invoice number and a bill for the new time only. I cannot share the PDF's generated as they have real world details on them. As expected for an Alpha release this is not ready for real use yet, sorry. George Taylor, found out why the printout of invoices fails so badly for me... I like most people and SME businesses here buy A4 sized paper. Your program is designed solely for Letter sized sheets. It is possible to pretend A4 sheets are Letter sheets because of large margins but the end result will be off centre print alignment. A barely usable workaround but much better if the program scaled the printable area to whatever the user selected as page size. i requested adding gbp to the payment options within this app and within an hour there was an update that added this feature fantastic app and better support.thank you for great service. I wish to thank everyone for their valuable feedback regarding my give-away, and I hope those who installed and activated it will get great use out of it. Also a huge thank-you to the GOTD team. Thank you for this Giveaway. Installed easily. The update was applied and a test run was successful. This will really help with my billing. Much appreciated George Taylor. George Taylor, I had to reinstall Windows and would like to purchase Power Time Tracker. What is your web address or how can I order it? Also, will the data from the "give away" version work on the purchased version? Also include a facility for adding parts charges and callout charges etc. Adding late payment penalties for unpaid invoices beyond the declared payment terms, make that multi-item too i.e. admin charge plus statutorily chargeable interest on overdue invoices at user definable annual rate. I would also like to see a minimum billing period i.e. billed in half hour increments or quarter hour increments. 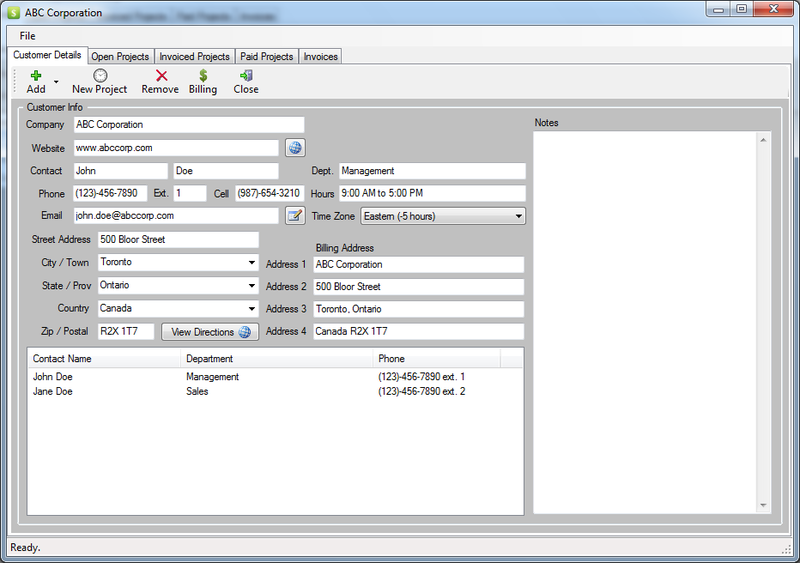 (make it user definable) Also include a facility for adding parts charges and callout charges etc. Adding late payment penalties for unpaid invoices beyond the declared payment terms, make that multi-item too i.e. admin charge plus statutorily chargeable interest on overdue invoices at user definable annual rate. I dont know what is going on but lately when i download a program and attempt to install it it never installs. The same is with the games. I am not sure if it is because I have windows 10 but, I have pretty much given up on downloading. There should be some configuration fields available to the user of the software. For example, the default currency should be select-able by the user so that they do not have to select it each time a new client is added. After setting up a client (Customer info), the address fields are filled in on the right automatically based on what was entered on the left. However, if changes are made on the left (such as change city, address, etc. ), the changes are not updated on the right. This requires the user repeat the changes again on the right. In this day and age, many do not have a regular phone, but do have a cell phone. If the client does not have a primary phone, but does have a cell phone, in Start Project screen, the default phone field is left blank. Why shouldn't the cell phone number be displayed instead? Are you still answering posts for this offer? @George Taylor: Are you still answering posts for this offer? Gary Smith, Yes, until the give-away ends or until I fall asleep. Power Music Organizer needs Microsoft .NET Framework 3.5 SP1. Would you like to download and install it now? So, to George: When .NET Framework 3.5 SP1 is required, it shows a bug ("Power Music Organizer" instead of "Power Time Tracker"). Really a good simple program. Easy to use and basic. Being able to import and export would be nice for bid proposals. I'm going to start using it for at least my handyman work. I don't think it is worth $49.95, though. For what it is, $19.95 would be more reasonable. Once it can integrate with other programs and becomes more customizable, I'm sure it will be worth $49.95. Thanks for putting it out there, George. I hope you keep improving it. It should become a money maker. Sherm Scott, Thank-you for the import/export suggestion. Price-wise, it comparable with a product called Fanurio ($59) but Fanurio is better in the sense it's multi-language and it has expenses. After saving preferences the bottom right status message reports "Preferences Saved" BUT if one then further changes something that then revives the Save button in the control bar the status message in the bottom right does not change to reflect that there are preferences that again need to be saved. The same events that generate the Save button need to change the status message to something appropriate. After saving preferences the bottom right status message reports "Preferences Saved" BUT if one then further changes something that then revives the Save button in the control bar the status message in the bottom right does not change to reflect that there are preferences that again need to be saved. The same events that generate the Save button need to change the status message to something appropriate. Found a bug, when moving the database from default path to a new prefered path the program does move the two .db files but on restarting and going through to the main user interface an alert box reporting license information is missing, upon investigation it became apparent that the program uses the database path to find the license.dat file but the license.dat file is not moved when the two .db files are moved so the program loses track of the license.dat file. Manual workaround is to move the license.dat file from the old database path location to the new database path. A workaround for the inapropriate use of user specific database location on installation as an Administrator with a different ID and runtime operation as a limited user would be to change the database path as the Administrator to a folder windows can read and can also handle writing to either directly or through vista and above virtualstore. Also another bug in preferences there apears to be no sanity checks on the fiscal year start and end dates! The program happily permits insane dates like fiscal year start March 1st and fiscal year end February 31st. I'm sure it should never permit a date like that! It should not allow 31st in 30 day months either but it will. Found a bug, when moving the database from default path to a new prefered path the program does move the two .db files but on restarting and going through to the main user interface an alert box reporting license information is missing, upon investigation it became apparent that the program uses the database path to find the license.dat file but the license.dat file is not moved when the two .db files are moved so the program loses track of the license.dat file. Manual workaround is to move the license.dat file from the old database path location to the new database path. A workaround for the inapropriate use of user specific database location on installation as an Administrator with a different ID and runtime operation as a limited user would be to change the database path as the Administrator to a folder windows can read and can also handle writing to either directly or through vista and above virtualstore. I'd use in Vista and above C:\ProgramData\Power Time Tracker\Data Also another bug in preferences there apears to be no sanity checks on the fiscal year start and end dates! The program happily permits insane dates like fiscal year start March 1st and fiscal year end February 31st. I'm sure it should never permit a date like that! It should not allow 31st in 30 day months either but it will. Thanks for providing a speedy update for version 1.0.0. After the "Get update" is clicked, there is the progress bar for the "downloading" step, and then it finishes. There is no indication as to what to do next. It does not seem to update the software since re-starting shows the update is still available, and the program still shows a built date of April 28 in the Help | About section. I tried inside the program "Check for updates" and after the download completes, the entire program exits. Restarting this time does not show that there is an update, but the Help | About build date is still April 28, 2016, and another Check for update shows the May 3, 2016 is still available. I cannot locate a downloaded file to apply the update. Can you describe what the user should do to apply the update? Thanks for providing a speedy update for version 1.0.0. After the "Get update" is clicked, there is the progress bar for the "downloading" step, and then it finishes. There is no indication as to what to do next. It does not seem to update the software since re-starting shows the update is still available, and the program still shows a built date of April 28 in the Help | About section. I tried inside the program "Check for updates" and after the download completes, the entire program exits. Restarting this time does not show that there is an update, but the Help | About build date is still April 28, 2016, and another Check for update shows the May 3, 2016 is still available. I cannot locate a downloaded file to apply the update. Can you describe what the user should do to apply the update? Gary Smith, the update process requires same rights as original installation. If you did not see an uninstall, followed by new install and re-register when re-launching then it's likely the update failed. If you don't see GBP in the currencies choices then the update has not happened yet. If there is an executable in the Updates folder you can try installing the updated version manually. The updated version is still called 1.0.0 presumably because the developer was in a rush to fix the omission and did not have a well defined versioning system in place. Gary Smith, the update process requires same rights as original installation. If you did not see an uninstall, followed by new install and re-register when re-launching then it's likely the update failed. In Vista and above the update installer is downloaded to: "C:\ProgramData\Power Time Tracker\Updates" If you don't see GBP in the currencies choices then the update has not happened yet. If there is an executable in the Updates folder you can try installing the updated version manually. The updated version is still called 1.0.0 presumably because the developer was in a rush to fix the omission and did not have a well defined versioning system in place. Andy, I think project expenses is a must, and that aspect is still under development. Thank-you for your suggestion. I think your on to something here, a time management program for business. But with so many big names in this field such as Sage ect, your up against some serious competition. Hope you take on a few of the suggestions listed here. RSebire, the competition is indeed serious. But I think some of the bigger competitors offer lots of additional features that freelancers like myself may not use, especially some of the web-based products. Thank-you for your comment. We are going on circles here, first the programmer shouldn't have released a software that had been thoroughly tested, cleared with bugs, user friendly and basic features included, problems installing and running? not being able to import or export data? restrictions on worldwide format for time, phone numbers and so on? This is an incomplete work that should have been taken back to the drawing board before its release, now it's useless to many and therefore the downvotes on the programmer and his product. The only way to succeed is to think WORLD, not Europe, think ALL languages, not only English, think compatibility, not restrictions. Do us a favor, retire to your lab for at least a month and come back with something we can say YES. We are going on circles here, first the programmer shouldn't have released a software that had been thoroughly tested, cleared with bugs, user friendly and basic features included, problems installing and running? not being able to import or export data? restrictions on worldwide format for time, phone numbers and so on? This is an incomplete work that should have been taken back to the drawing board before its release, now it's useless to many and therefore the downvotes on the programmer and his product. The only way to succeed is to think WORLD, not Europe, think ALL languages, not only English, think compatibility, not restrictions. Do us a favor, retire to your lab for at least a month and come back with something we can say YES. I haven't had time to play with it much but it looks promising. I did change the database path and it then said the registration was missing. I had to go and manually move that. I know you said that you hope to add mobile in the future, which would be nice, but I do most of my work on my PC in my office but also occasionally use my laptop. It would be nice if they could be linked or know what files need to be transferred between so you could use either on the same project. Thank you George and GOTD. 1) In the preferences, the "Next Invoice #" field should allow dashes, underscores, and slashes. My Invoice numbering system is 2016-11352-00 - which is the year, actual invoice number, and any revisions to the actual invoice number. At this point, with the restrictions in that field, the program is won't work for me. 2) Again in the preferences section - no City, State, Country, or ZIP????? # 2 isn't a biggie, but until #1 is fixed, I can't use the program. Rich, Thank you for your suggestion. I too use dashes in my invoice numbers, but I want to move away from that to simplify the invoice numbers for my clients. Still, some people prefer their own format, so that is something I will definitely consider. The developer really hasn't thought this one through has he? Derek Lawler, that is simply the product of a lone developer making something for their own very specific use, thinking they could monetize the work and use GAOTD to find some free, or even get paid by GAOTD for putting his early pre-release work out to unannounced, alpha test which is normally done in private under a Non-disclosure agreement. TK, as the old saying goes; necessity is the mother of invention. 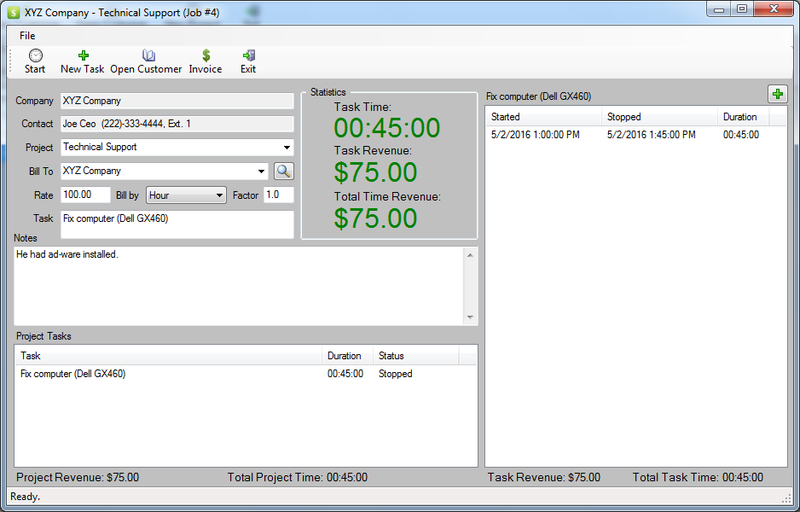 With that having been said, I really did need a way to track my billable time and create invoices. I really wasn't keen on putting sensitive customer details in the cloud, and I don't need to collaborate with a team. I'm also not a huge fan of endless charts and graphs. All I wanted was something simple and fast that I could use to launch a job with the least amount of steps. I think I accomplished that, and I'm confident that if I implement all of the suggestions that were made during my give-away, I'll get a revenue stream out of it. Any spreadsheet does better job than this restricted software. The developer is not even giving time when will it expire on its own. Pass. dean, A spreadsheet will not time your work. This looks to be a very practical and useful software program for those billing their time, HOWEVER, if you want it to reach an international market, then you are going to have to ADD other currencies, other than the three you have, USD, CAD and EUR. Hello George This looks to be a very practical and useful software program for those billing their time, HOWEVER, if you want it to reach an international market, then you are going to have to ADD other currencies, other than the three you have, USD, CAD and EUR. Thanks anyway. Hughjocapivvy, I fully agree. Thank-you for your feedback. and for jotting time and jobs hardly worth installing. Sorry dear developper, looking outside the box has been and will continue to be essential. For international clientele definitely no use as far as billing is concerned and for jotting time and jobs hardly worth installing. Sorry dear developper, looking outside the box has been and will continue to be essential. 1: It needs to install the data folder in a non-Documents location, so it can be installed by an Admin account and run by a normal account. 3. Phone numbers are only accepted in US/Can format. Most of the world uses other formats. Please remove this restriction. I also think it ought to be possible to export data to a spreadsheet. A lot easier than typing it all again! This would be a great bit of software with a few tweaks... 1: It needs to install the data folder in a non-Documents location, so it can be installed by an Admin account and run by a normal account. 2. Why not allow different currencies? It supports USD, CAD and Euro, but I want GBP. Other currencies exist too! The list should be user-configurable 3. Phone numbers are only accepted in US/Can format. Most of the world uses other formats. Please remove this restriction. I also think it ought to be possible to export data to a spreadsheet. A lot easier than typing it all again! Iain Harrison, Thank-you for your suggestions, especially user-configurable currencies. The phone number fields should definitely have an option to remove or enable the masking (brackets and dashes). The ability to export data has been suggested more than once, so obviously that would be a popular requirement. this looks to be a useful piece of software but unfortunately in my line of work it just wont have much of an application. I work with a group of on the road techs using tablets, so what would be ideal for me would be a lightweight android interfacable option that also has a database of parts and a method to connect to a server so I could update said parts. I also noticed from the screenshots that there is no tax option, some states either have or are looking at making certain labor tasks taxable, so if this dosent have the ability to do that it may have to be added for more universal application at some point. Squishy, There is indeed an option to add state or provincial taxes in my software. Taxes can also be defined as two combined tax rates, as in a harmonized tax rate. As for mobile use, that is something I would definitely like to add down the road. Thanks for your feedback. This product is almost exactly what I've been looking for. It only lacks the autostart features of Allnetic Working Time Tracker (which appears to be abandonware). However I'm having a LOT of problems with Power Time Tracker. On start, it says "The [name] database is missing or corrupted. Please set the path to the database" each time I start it. I select a folder and it says "Power Time Tracker will shutdown and needs to be restarted". Then when it is restarted, it says "The [name] database is missing..." If I re-install the program, it works. The underlying problem is that it has to be installed by a user that has an Admin account and it stores its database in that user's documents folder. So of course when it restarts, running as a normal user, it can't access its database. The cure is to move the database to a more sensible place. So now the next problem. It isn't possible to set up my company details properly because the telephone number field is fixed to US number format: it won't accept a UK phone number. I can't find a way to select the GBP. Is there some way to correct these issues? It would make the product usable in the UK. This product is almost exactly what I've been looking for. It only lacks the autostart features of Allnetic Working Time Tracker (which appears to be abandonware). However I'm having a LOT of problems with Power Time Tracker. On start, it says "The [name] database is missing or corrupted. Please set the path to the database" each time I start it. I select a folder and it says "Power Time Tracker will shutdown and needs to be restarted". Then when it is restarted, it says "The [name] database is missing..." If I re-install the program, it works. The underlying problem is that it has to be installed by a user that has an Admin account and it stores its database in that user's documents folder. So of course when it restarts, running as a normal user, it can't access its database. The cure is to move the database to a more sensible place. So now the next problem. It isn't possible to set up my company details properly because the telephone number field is fixed to US number format: it won't accept a UK phone number. I can't find a way to select the GBP. Is there some way to correct these issues? It would make the product usable in the UK. Iain, Hello and thank-you for your great feedback. GBP was added an hour ago and there's an update for that. Please select "Help" -- "Check for updates" to get the hot-fix for that. I'm storing the application data in the My Documents folder by default, and I don't understand why you can't properly customize its location. Please contact my support email directly at my website, this sounds like a serious issue. Just opened the program up again and it informed me that there was an update regarding GBP and after using it the program functioned satisfactorily. Pleasing to see such a quick response. Regarding the input of a British telephone number; the zero at the beginning of the area code is not necessary and by dropping this I was able to add my telephone number in full. Iain, Just opened the program up again and it informed me that there was an update regarding GBP and after using it the program functioned satisfactorily. Pleasing to see such a quick response. Regarding the input of a British telephone number; the zero at the beginning of the area code is not necessary and by dropping this I was able to add my telephone number in full. George Taylor, if the database is installed to the system admins documents folder then no amount of customisation by the limited users account will allow the limited user to access the system admins documents folder where the database was deposited! In the program itself you should have the facility to create a new database by an admin user of the program in a windows linited user specific folder for non-shared databases or public shared location for a multi-user shared database. The problem is simply that you are using My Documents by default. The advised way to run a Windows PC is to normally log in as a non-admin user, only switching to an admin user to install stuff. And that's what I do. Install this program as an admin user and it stores its data file in that user's folder by default. Then when you open the program as a normal user, you have no access to that Admin user's My Documents folder, so you are asked to select the data location, and you can't. So the program can't run. Without being able to run it, you can't change the data location. The workaround to this is to either run it as the Admin user and change the settings from there, or to go through the installation routine again and change the data location on first run. The biggest issue is not finding a workaround: it is knowing what is going wrong. There are no error messages that give a clue. You're not asked where to store the data as part of the install routine (I don't remember being asked, anyway), so you wouldn't think to check it on first install. And you can't do that later unless you log in as an Admin user. George Taylor, The problem is simply that you are using My Documents by default. The advised way to run a Windows PC is to normally log in as a non-admin user, only switching to an admin user to install stuff. And that's what I do. Install this program as an admin user and it stores its data file in that user's folder by default. Then when you open the program as a normal user, you have no access to that Admin user's My Documents folder, so you are asked to select the data location, and you can't. So the program can't run. Without being able to run it, you can't change the data location. The workaround to this is to either run it as the Admin user and change the settings from there, or to go through the installation routine again and change the data location on first run. The biggest issue is not finding a workaround: it is knowing what is going wrong. There are no error messages that give a clue. You're not asked where to store the data as part of the install routine (I don't remember being asked, anyway), so you wouldn't think to check it on first install. And you can't do that later unless you log in as an Admin user. That's only cosmetic, but it is not good. If it was a London number like 0207 946 0057 it would be shown as (207)-946-005 which is leaving out a digit. Salvia, You are right, it is possible to enter the number without the leading zero (which is technically correct) However, that makes the number read (123)-456-7891 where we would display 01234 567 891 That's only cosmetic, but it is not good. If it was a London number like 0207 946 0057 it would be shown as (207)-946-005 which is leaving out a digit. Hmm. I'm not so sure I was right about the London number. I tried entering a London client's number and it looked so alien that I thought it was wrong, but I don't think it was. TK, There is an option to move the database to a different folder in its Preferences screen. Hope that helps. TK, thank-you for your comment. Iain, Thank-you for your input. It makes sense and I will seriously consider your suggestion for future releases. Everyone, let's make this give-away a huge one! Tell your neighbor, tell your co-worker, tell your dog! I'm really amped-up on this give-away and I want LOTS of people to get some great use out of my software!! My dog wants a cheese dispensing addon for this software. More seriously, it would benefit from more localisation facilities. Currency, date format, phone number format - these would be easy to fix. Multiple languages would be a little more tricky, but worthwhile. Even in the USA, 30% of people are not native English speakers. George Taylor, My dog wants a cheese dispensing addon for this software. More seriously, it would benefit from more localisation facilities. Currency, date format, phone number format - these would be easy to fix. Multiple languages would be a little more tricky, but worthwhile. Even in the USA, 30% of people are not native English speakers. George, International support and user definable currency should be considered in the next version. An animated icon whilst at work in the taskbar would be great too! All the best, I use Klok. Iain Harrison, most dogs can't stand cheese, but I hear you on the localisation, currency, and phone number formats. As for the date format, I believe it follows whatever date format you have set. Thanks for your feedback. Where is the link for the video tutorial? I am a bit confused as it keeps telling me "error saving preferences:Object reference not set to an instance of an object"
Brian H, What version of Windows are you using? I am a freelancer and I wanted something simple to record my billable time, so I built this piece of software. I am glad to share this piece of work with others who are looking for a simple yet concise method of managing their freelance projects. In addition to my promotion, I will be issuing hot-fixes for serious issues. Good morning Mr George Taylor and thanks for your offering. Your product installed fine on my windows 10 x64 (home/standard) machine. It seems this software is aimed to USA citizens only, isn't it? I can "say" this because of time, hours, time zone and date settings. And the only language available is English (or American English). Good morning Mr George Taylor and thanks for your offering. Your product installed fine on my windows 10 x64 (home/standard) machine. It seems this software is <b>aimed to USA citizens</b> only, isn't it? I can "say" this because of time, hours, time zone and date settings. And the <b>only language available is English</b> (or American English). xilolee, It's currently intended for North American and European customers, but making it multi-language and multi-currency will go a long ways. AnAceBuyer, Thank-you for your valuable feedback regarding the product and the website. The importing / exporting spreadsheets is a great suggestion and I appreciate your feedback! it could be useful for the other users of GAOTD and for the developer if you'll post WHAT antivirus and firewall and antimalware suites you are using at the moment. Maybe you could try to suspend your antivirus just for the time you are installing it: this often helps to install the software given away. It could be your antivirus marks the GAOTD setup.exe as false positive. Hope this helps and looking forward for your feedback. Hi <b>Andy</b>, it could be useful for the other users of GAOTD and for the developer if you'll post WHAT antivirus and firewall and antimalware suites you are using at the moment. Maybe you could try to suspend your antivirus just for the time you are installing it: this often helps to install the software given away. It could be your antivirus marks the <b>GAOTD setup.exe</b> as false positive. Hope this helps and looking forward for your feedback. Andy, Unbelievable. You posted an "endorsement" to FB before you even downloaded the product? How sad is that. A simple but unusual registration process; on opening on the screen there is a button with the word registration on it, click this and it opens to a window with all the registration details in it. After this the program ran without any difficulty and it contains a useful help system. A simple but unusual registration process; on opening on the screen there is a button with the word registration on it, click this and it opens to a window with all the registration details in it. After this the program ran without any difficulty and it contains a useful help system. Salvia, Thank-you. I designed the registration process to be as simple as possible, without the need to register an account or jump through numerous hoops. I think more vendors should do things this way in order to make their give-away an enjoyable and hassle-free process. System.Configuration.ConfigurationErrorsException: Failed to save settings: An error occurred loading a configuration file: Could not find a part of the path 'C:\Users\Linda\AppData\Local\Microsoft\PowerTimeTracker.exe_Url_0pp5qrqzvkklpzqxf4jeuxkebdrlf3zr\1.0.0.0\58mgnlfc.tmp'. (C:\Users\Linda\AppData\Local\Microsoft\PowerTimeTracker.exe_Url_0pp5qrqzvkklpzqxf4jeuxkebdrlf3zr\1.0.0.0\user.config) ---> System.Configuration.ConfigurationErrorsException: An error occurred loading a configuration file: Could not find a part of the path 'C:\Users\Linda\AppData\Local\Microsoft\PowerTimeTracker.exe_Url_0pp5qrqzvkklpzqxf4jeuxkebdrlf3zr\1.0.0.0\58mgnlfc.tmp'. (C:\Users\Linda\AppData\Local\Microsoft\PowerTimeTracker.exe_Url_0pp5qrqzvkklpzqxf4jeuxkebdrlf3zr\1.0.0.0\user.config) ---> System.IO.DirectoryNotFoundException: Could not find a part of the path 'C:\Users\Linda\AppData\Local\Microsoft\PowerTimeTracker.exe_Url_0pp5qrqzvkklpzqxf4jeuxkebdrlf3zr\1.0.0.0\58mgnlfc.tmp'. Drek Meek, What version of Windows are you using? George Taylor, Why on earth would anyone vote my comment down? I'm the developer of this product and I'm trying to help. George Taylor, 99.99% are using win 7,8,10, this software should not have any problem with windows, unless there is something in it that rest of us do not know. George Taylor, don't worry yourself about the comment votes the original poster with the is still heavily voted down even though they posted very useful information for a developer to look at. I would say the error report came from a Vista or above windows operating system from the use of C:\User rather than C:\Documents and Settings parent folder. As TK said don't worry about the negative votes, unfortunately the site has acquired a number of followers who vote even the most helpful suggestions and requests for help down. Thanks for taking the trouble to help the more sensible commenters. Just an idea but wouldn't it be easier to leave the telephone number input unformatted rather than that suitable for Canada. George Taylor, As TK said don't worry about the negative votes, unfortunately the site has acquired a number of followers who vote even the most helpful suggestions and requests for help down. Thanks for taking the trouble to help the more sensible commenters. Just an idea but wouldn't it be easier to leave the telephone number input unformatted rather than that suitable for Canada. dean, I suggest you run my installer past virustotal and then come back here and delete your comment.